Orlando City Hall in Downtown Orlando, Florida, as it appeared from 1958 to 1991. The building was located on the corner of South Street and Orange Avenue and acted as the place of governance for the growing Orlando area. The painting was created by James Stoll and is paired with the Orlando Remembered Exhibit located in the Orlando City Hall Building, located at 400 South Orange Avenue. The 1958 city hall was designed by Richard Boone Rogers and constructed by the C. A. Finland Company of Tampa. Dedicated on October 3, 1958, the building was faced with Tennessee marble, Minnesota granite and terrazzo stones. 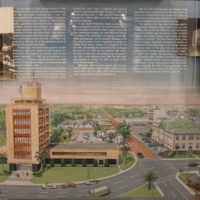 The Orlando Utilities Commission was located within the building from 1958 to 1967, when it moved into a $3.5 million building at 500 South Orange Ave. The Orlando Police Department (OPD) remained in the previous city hall building, which was the original Orlando Public School, across the street. In January of 1972, OPD and the city jail relocated to the Municipal Justice Building at 100 South Hughey Avenue. Simons, George W., Jr. "Comprehensive City Plan Orlando, Florida, Vol III." Digital Commons, University of North Florida. http://digitalcommons.unf.edu/cgi/viewcontent.cgi?article=1029&context=simonsflorida. Stoll, James, "Signature Plaza Painting.” RICHES of Central Florida, accessed May 9, 2016, https://richesmi.cah.ucf.edu/omeka/items/show/4592. Stoll, Jim. “Orlando City Hall Painting.” RICHES of Central Florida accessed April 19, 2019, https://richesmi.cah.ucf.edu/omeka/items/show/7887.